Do you love that familiar memory foam feel and contouring? Still, you would like to have some of the bounce and cooling properties of coil or latex construction? Why not go with a hybrid bed and get the most out of both worlds without significant downsides? The big question most people ask is: Are hybrid mattresses any good? The truth is, they tend to be great for people that like the best of each type of mattress (we’ll explain more). Our goal is to help you identify your ideal hybrid bed so that you can buy it with confidence without even trying it out. Why Choose it Over Single Material? 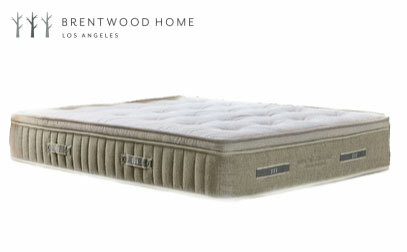 Alexander Signature Hybrid is a substantial, luxurious bed made up of four layers of comfortably contouring foam and a zoned coil layer underneath. The top layers of the mattress provide pressure relief while innersprings aid in support and alignment of the spine. What makes it unique? 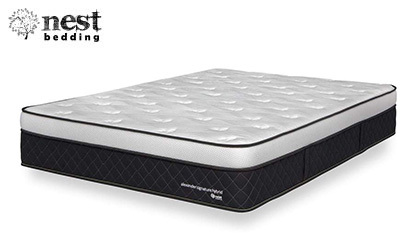 Alexander Signature Hybrid has an exceptionally balanced feel for a bed that combines both foam and coils. It has support and pressure relief, deep bounce, and an individually wrapped coil system to help negate motion transfer. The balanced feel provides a lot to love for nearly every sleeper. In addition, its foam layers and cover have enhanced cooling measures so you can be cradled by the foam without overheating. It excels in edge support with edge-to-edge coils that are firmer around the perimeter. Plush, Medium, and Luxury Firm options are available, so whether you sleep on your side, back, or stomach, or prefer a certain level of firmness, you can find the fit that works best for you. An additional perk is the company’s Lifetime Comfort Guarantee that stipulates that mattresses during the trial period can be exchanged or returned for free and any switches after that time can be made for 50% of the new model’s retail price. Check our in-depth review of the Signature here. 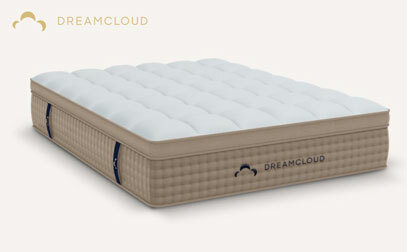 DreamCloud packs premium materials into a well-designed hybrid bed. The incredibly soft cashmere cover with tufting that envelops the Euro-style pillow top delivers a comfortable first impression that carries through the entire night. The bed is crafted with a combination of zoned coils, memory foams, and latex that each bring a different aspect to the overall performance of the bed. There is support for stomach and back sleepers, as well as pressure relief for individuals who spend time on their sides. There are even cooling measures, such as a gel infusion, and air is able to circulate through the coils to help with cooling as well. What stands out? DreamCloud’s luxurious feel and quality construction represent an exceptional value in the marketplace. There are significant savings when compared to in-store models with similar qualities. Another mark of high-quality construction is the edge support on this model. There is a special foam layer around the perimeter that results in a higher level of support than many bed-in-a-box brands. There are even handles on the side to help move the bed around. Driving further value is the 365-night risk-free trial period, in addition to the company’s Everlong Warranty. Shipping and returns are completely free and the brand will provide a mattress cleaning if you need one at no cost. For more specific details of this bed, visit our full analysis of the materials, feel and structure. The WinkBed has a construction that supplies durability and comfort. Its layers include dual pocketed coils with Micro Air-Springs™ and tempered steel support springs, in addition to designer foams and firm edge support. The overall effect is a bed that holds up extremely well over time without sagging. The Tencel cover is soft and wicks moisture away, helping to foster a dry sleeping environment. The coil layers help to move air through the bed and the gel foam is yet another cooling measure. What makes it special? Each WinkBed is constructed by hand with durable quality materials from the USA. Third-party testing evaluated this brand’s durability and support, and it exceeded expectations. The WinkBed has three firmness levels – Softer, Luxury Firm, and Firmer. The company’s most popular selection is their Luxury Firm model, as it accommodates most needs and preferences for couples and individuals. There is also a Plus option (a latex and innerspring hybrid) designed specifically for individuals over 300 pounds, which provides even more durability and support through a latex layer addition and triple-zoned coils. Brooklyn Aurora is an excellent solution if you have been known to overheat at night. Sleepers will notice that cover is cool to the touch, as it is created with an infusion of phase change materials that disperse heat from the body. The coil layer is naturally conducive to airflow, which is a huge aid in temperature regulation. In the comfort layers, infusions of TitaniumGel™ and copper actively conduct heat away from sleepers. What makes it unique? Brooklyn Aurora’s cooling features, such as its cover with phase change properties, gel infusions, and overall airflow, work together to form exceptional cooling capabilities. With a 120-night trial period, the company provides an extended risk-free time to see if the cooling is everything you need for your best night’s sleep. There are three firmness levels to choose from, including Soft, Medium, and Firm options. While most individuals may find that the Medium works well for them, stomach sleepers who need their hips to stay more on top of the mattress may opt for the Firm version. Likewise, people who only sleep on their side and need more pressure relief may choose the Soft. Jump straight to Aurora review if you want to see our evaluation. Cedar Mattress utilizes Dunlop latex in combination with innersprings and a variety of organic and natural materials to form its hybrid design. The latex is aerated, a feature that allows air to move through its layers. Latex tends to sleep naturally cooler, so its aeration in addition to the air-filled coil layer below regulates temperature throughout the night. Of the two latex layers in the bed, the second has been purposefully constructed to form targeted zones along the body that enhance comfort. There are grooves cut into the foam that create pressure relief for the hips and shoulders, as well as support in the lumbar region. The notches cut out of the foam help airflow even more. What stands out? Cedar Mattress is an impressive hybrid with a high amount of natural materials, including Dunlop latex. A supportive zoned coil set complements the top comfort layers and adds extra edge support, making it a great latex and innerspring hybrid. Organic cotton alongside New Zealand wool and thin layers of coconut husks and flaxseed complement the other materials in the bed and help to make it an eco-friendly product. Overall, the bed has a comfortable medium level of firmness that should work well for most sleeping positions. With a few clicks, you can answer Helix’s online Sleep Quiz and have the perfect bed shipped straight to your door. By evaluating items such as temperature regulation, feel, and point elasticity, the brand will select and send you a comfortable sleep solution that fulfills your wants and needs. 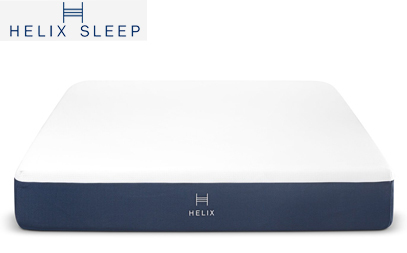 Helix uses a combination of foams and pocketed micro coils with varying densities to respond to the results of the Sleep Quiz. If you have higher weight considerations, a firmer choice may be selected. There's even a choice for sleepers with substantial weight considerations. What makes it special? Helix’s customization process helps to ensure that you will get mattress tailored to your needs. It will feel like it is handmade to your preferences and body type – because it is! Helix has over 9 different color-coded and differently named models to choose from, and your quiz will tell you exactly which you should order. Are you part of a couple? Helix offers blending, where the results of you and your partner’s quizzes are used to choose a bed that works well for both of you. However, you can also opt for a dual comfort model, where the mattress is split down the middle with individual preferences on either side. See our in-depth review based on our grading process if you want to learn more about this bed. 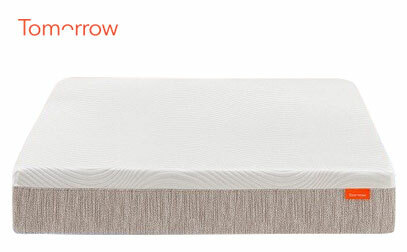 Tomorrow Sleep’s design incorporates a mix of foams and coils, and there is a distinct memory foam feel to this bed. This is due to its top two memory layers that sit above the bounce foam and coil system. What makes it unique? By incorporating a phase change material, sleepers can enjoy a deeper memory foam feel without the disadvantage that traditional memory beds face with sleeping hot. In addition, there is some bounce to the bed, but impressively high motion isolation for this type of construction. Tomorrow Sleep comes in two firmnesses – Medium Soft and Medium Firm. For individuals looking for even more pressure relief or who sleep on their sides, the Medium Soft version may be your best fit. Oppositely, stomach sleepers or those who enjoy a firmer feel may find the Medium Firm version more enjoyable. While Tomorrow Sleep is a relatively newer option, the brand is backed by a warranty from well-known, large manufacturer Serta Simmons Bedding. We had a chance to review it, and if you're interested you can read our thoughts and analysis here. With elements such as upcycled steel, organic cotton, natural latex, and wool from New Zealand, Avocado has a lot to offer the green-minded consumer. 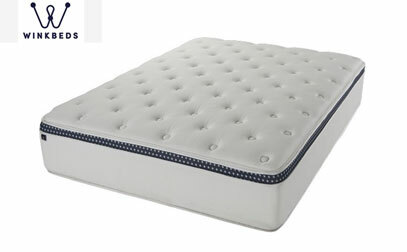 The standard version is a slightly firmer bed, and a Euro-style pillow top with two inches of additional Dunlop latex can be added for additional comfort. What stands out? Avocado is a good option for people who value natural and eco-friendly products, as well as a more traditional innerspring feel. 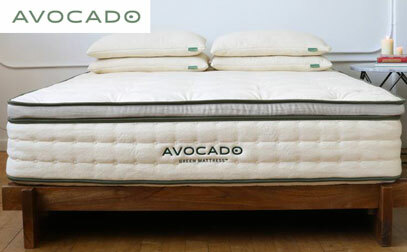 By using tufting as a method to connect the layers instead of glues or adhesives, Avocado has extended the durability of the bed and avoided unnecessary chemical additives. The base layer of upcycled steel coils is individually pocketed to lower motion transfer. It is also zoned for more support in the hip region and pressure relief in the shoulders. The springs are reinforced around the edges and Avocado offers all-around great edge support. Jump to our in-depth analysis of the Avocado Green bed for more information. Brooklyn Signature’s hybrid design leans towards a premium feel for a very good price. Instead of some beds that make the sleeper feel stuck, the Signature’s hyper-elastic foam and coil layers provide a gentle cradle, bounce, and quick-responsiveness that makes it easy to move around on. What makes it special? 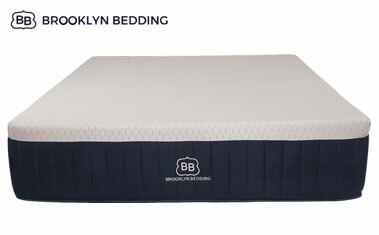 Brooklyn Signature is manufactured by Brooklyn Bedding, a brand that owns their entire manufacturing process. By forgoing middlemen and selling directly to consumers, they are able to price products in a lower bracket while providing high-quality materials. Brooklyn Signature is offered in three firmnesses, including Soft, Medium, and Firm. Combination sleepers and most back sleepers will be well-served by the Medium, while people who lie on their sides and need enhanced pressure relief may have more success on the Soft. For individuals who like a firmer feel or who sleep on their stomachs and need more support, the Firm version may be best. For a full break down skip to our review of the Signature here. Obviously, the first thing we’d want to do is to shed a little light on the matter. Before you go ahead and choose a hybrid mattress, you’d want to be aware of its benefits and the considerations you’d have to account for. It’s a type of bed which is made of using at least two (but could be more) different types of unique materials, and are typically made out of a layer of coils, another word for innersprings. This mix of materials allows the user to capitalize on the advantages of the components which are used. There are a few popular examples which are very sought after in recent years – the combination of memory foam and latex and the combination of memory foam, latex, and innerspring/coils altogether. Both of these types have a compound of benefits. Let’s take the first example. If you bought a bed that’s foam-based and latex-based, you’d be able to experience the contouring capabilities of the foam and the responsiveness and breathability of latex. This allows the user to get a great sleeping sensation altogether, which is the primary purpose of this type of bed. The main thing here, and the reason that a lot of people go with the former is that memory foam on its own is not very responsive and the traditional kind can be quite hot to sleep on – it is known for retaining a lot of heat. A hybrid, on the other hand, helps addresses these issues with airflow while maintaining the excellent contouring properties of the foam. The main issue with innerspring models is that they tend to feel exceptionally bouncy (which not everyone is a fan of) and the coils may poke through a cheap model. By using additional layers of foam or latex, depending on the hybrid, this issue is easily resolved as the mattress itself should have the excellent coil foundation and the comforting layers atop. We would be remiss if we did not bring up the hybrids made from foam. Mixing layers of different materials (such as latex, memory foam, and polyurethane) can provide many advantages, from added cooling to exceptional pressure relief, as well as low bounce for those who prefer that style. Although coils are a popular base material for most products in this space, mixing and matching foam has become very popular in recent years and is something to consider on your search. It can help combat some of the issues faced with traditional memory foam products. That’s just it – a hybrid mattress will combine the benefits of the core materials. A foam-based bedding system could become responsive and breathable if you combine it with a top layer of latex, for instance. An innerspring mattress could become soft and supportive if you put a top layer of memory foam on top of the foundation of coils. Coil-based beds tend to have faster response, cooling, and bounce. Their main advantages hide behind the solid foundation which delivers a nice push-back as you lay down. This helps in the areas of proper spinal alignment and enhanced support. Of course, on the flip side, they also have increased motion transfer, making it likely to feel some movement your sleeping partner makes. The goal of foam-based mattresses is notably different. They typically intend to allow the sleeper to go ahead and sink deeper into the bed. They focus on enhanced contouring, pressure relief, and deep-compression support. They are particularly silent, and they have very little motion transfer. In other words – you can move as much as you want and this shouldn’t wake your partner up. With this said, they are not typically as responsive, and they are usually hot to sleep on (if using traditional types without gels, etc.) as the heat retention can be significant. Gel has revolutionized once traditional material in the industry. By injecting or infusing it into memory or other foams, heat retention has been cut, which means more enjoyment for those who love to sink deep into their beds since they run much less of a chance of becoming uncomfortable from the heat. If you’re looking for a mattress which is incredible for dampening motion transfer yet, it provides the appropriate amount of bounce and support, combining both of the above materials would be a great call. 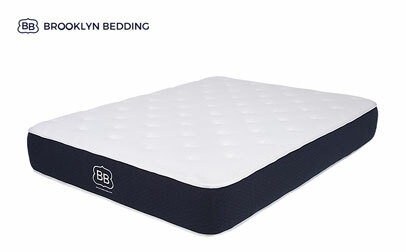 The result should be a supportive, reliable foundation covered with body-contouring and soft comforter layer that makes you feel as if you are sleeping on a cloud but with enhanced back support. Now that we’ve seen some of the best options on the market, let’s see how the hybrid beds compare to other popular types. The latex mattress is great if you are looking for something responsive and cool. This is a material that breathes a lot, and it helps guarantee that there is no heat retention. At the same time, it’s not always contouring enough for some. Foam-based hybrids can provide you with the same capabilities but also enhance the molding and contouring that you might require. Beds with springs in them are great as they provide a solid push-back as you lie down on them initially. This is definitely something that many people appreciate. However, they do tend to make lighter sleeper feel as if they are floating on top. If you add a top layer of latex or memory foam, this sensation can be lessened. It's a matter of preference and individual alignment needs. The main disadvantage of traditional foam mattresses is that they might lack the necessary support and retain heat quite a lot, though not if you go with a modern design. At the same time, they are fantastic for pressure relief, comfort, and contouring. Combining them with both latex and coils could be an excellent solution as it takes away the downside while retaining the advantages. Let's take a look at some of the features we look at while analyzing individual mattresses. The firmness remains one of the most important things to consider when you’re getting a mattress, even if it is a hybrid one. It is estimated that roughly 80% of the people prefer medium-firm beds. At the same time, the firmness is determined by your specific requirements and preferences regarding sleeping patterns, as well as your physical characteristics. For instance, heavier sleepers might want to go for a firmer mattress as a softer one could sink a lot, making them come in touch with the base layer which has the potential to create more pressure points. Obviously, the sleeping position can play a serious role when it comes to choosing a hybrid mattress, just as it is with any other bed out there. If you prefer to sleep on your back, you should be looking for a bed that’s going to provide you with the necessary support and spinal alignment. This usually means that you’d want a top layer of conforming foam in order to ensure that you are comfortable and well-supported. At the same time, combining the foam with a spring construction should provide a nice and expressed push-back for enhanced support. Stomach sleepers can also consider a hybrid mattress that’s supportive yet comfortable enough to deliver a nice sleeping sensation. If you are lighter, you can try a lot of combinations, like combining memory foam and latex. If you are heavier, you might consider combining foam, latex, and coils for the enhanced push-back and support. It’s known that side-sleeping positions tend to put the most pressure on your joints. As such, you need to focus on something that can adhere to the shapes of your body and provide you with solid support. Be careful if you pick a coil-based model that it gives you the proper sinkage. You can also go for a foam-based and latex-based bed as it should be responsive enough and supportive to your spine while giving you a cradle. If you get a properly combined hybrid bed, you should stay cool. An abundance of people want to sleep on nice and contouring memory foam, but the traditional stuff has a serious heat retention issue – it doesn’t allow a lot of air to pass through it and, as such, it is common to wake up sweating through the middle of the night. A combination of foam and coils or foam and latex will help to make you sleep cooler than the majority of pure foam beds. Hybrid mattresses provide great value for your money. That’s why you will see that some of the best brands out there take advantage of this combinative technology. Most of the well-known names use combinations of the core materials in order to draw the maximum benefits of them all and deliver the ultimate sleeping sensation for the user at an affordable cost. Hybrids are viewed as more reliable and durable than single-material units. For example, if you take an innerspring mattress, you may feel the springs peeking through in a year or two. If you cover the coils with foam or latex, however, this should definitely not going to be the case. Boxed mattresses can represent substantial cost-savings compared to those available in retail stores because they reduce the costly supply chain and deliver directly to their consumers. This is definitely something to consider when shopping for a hybrid because more complex support systems can often cost you a lot more inside a retail store. Hybrids that come packed into boxes may be rolled and compressed, or they might not be. This can influence the materials that are used, as bed-in-the-box brands must choose from materials that can be more easily compressed. This could potentially affect features like edge support and firmness that may be priorities of yours, so it is important to consider these details when evaluating these brands. You shouldn’t assume that all online brands are delivered this way, however. Some have chosen to forego the compression process, often claiming that they can use firmer materials. Especially with luxury brands, companies are able to offer free professional delivery to accompany their product into your home. Wondering if a boxed bed is for you? Read more. It goes without saying that there is quite a lot of merit in picking a hybrid mattress. However, as you can see, there are a lot of things to consider. We hope that you found what you’re looking for in this piece. Additionally, the choices that we’ve presented to you as formidable options of hybrid beds are amongst the most popular on the market. They combine extraordinary features and offer them at affordable, competitive prices. And if you're still not sure and you want to see other good options, you can see our 2019 top bed picks here. Any suggestions on a good hybrid for a heavier person, back sleeper? All hybrids are good in this regard, but Winkbeds has a special “Plus” version and they say it’s made for larger people. 5. I currently weigh 300 lbs and am 68 years old. Hope to weigh 200 lbs within a year. I got my Brooklyn Aurora a few months ago and I don’t think I have ever been more satisfied with my sleep. I think it’s the best mattress available on the market. It has fantastic cooling technology which is of a very high importance to someone who sleeps hot (everyone with the same problem will understand). Either way, I have never slept better in my life and I wake up feeling fresh and rested. Worth every penny. I’ve bought one for my husband and myself recently and we both love it. It’s breathable and has fantastic temperature regulation. It really met our expectations considering the price. It performs just as it was advertised. Cedar is a hell of a mattress, too. Extremely comfortable (at least for a side sleeper), made out of organic, eco-friendly materials, No sinkage, great pressure relief. It was delivered promptly, we had no issues at all. Without further ado, my experience – great company, great customer service and most importantly – great mattress. Thank you so much for all the reviews on your site,it’s really relieving to have it all at one place. I had a major neck issues and with my old innerspring getting saggy I thought I’ll never be able to sleep again. Avocado made my life a lot easier. I never thought it can be as easy as that. Hey Dante! Thanks for reaching out! 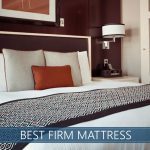 I think what you’re looking for is our Best Mattress for Side Sleepers list. There’s 8 to choose from, and I hope you find one that works well for you. Let us know what you pick!! I got my Alexander Hybrid 6 months ago and I sincerely enjoy sleeping on it. It’s a perfect mix of support and pressure relief. The thing I love the most about Alexander is that it’s not bouncy as my old one. I just hate that. Great motion reduction, too. I can finally sleep at peace. I am looking at buying the cypress mattress, made by the same company as the cypress. I am looking for a safe, non-toxic mattress. Do you think the Cypress is a good, natural mattress. Check out our list for organic products for a list of our choices!